A relay course has one of more forks, consisting of multiple branches with controls, as many as there are legs on the relay team. The purpose of a fork is to separate team members on different teams so as to prevent following. The course for a relay team member will use one of the branches from each fork on the relay course. The other team members will run the other branches, so that eventually the team will have covered all the branches. The combined course of all the team members will be equivalent for all teams, but the teams will have run the branches in different order. A Regular fork is the standard, "FARSTA fork". Each team member runs one of the branches, in random order. For example on team 101. leg 1 takes branch B, leg 2 takes branch C, and leg 3 takes branch A. On team 102, leg 1 takes branch A, leg 2 takes branch C, and leg 3 takes branch B. "Simple" relay course, consisting of 2 Regular forks with each 3 branches. This course is for a relay with 3 team members, and from this you can construct 3*3 = 9 different course variations. When distributing these onto teams, you can accomodate (3*3) (leg 1) * (2*2) (leg 2) = 36 different teams, where each team member will have a different variation than all other teams on the same relay leg. The relay concept has developed over the years, and various variants are used. For example, the third leg on the relay can have an extra loop, making it longer than the two other legs. Condes has support for such "extended" constructs. 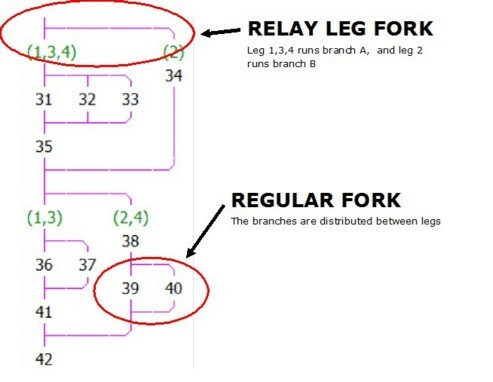 This is a fork, where each branch is bound to a certain relay leg, see the figure below. In the figure, leg 1,3,4 runs branch A in the first fork. Leg 2 runs fork B. Fork B is shorter than Fork A. When you "bind" two forks, a given course variation will use the same branch in these two forks. So if the course variation uses branch A in the first fork, it will also use branch A in the second fork. This reduces the number of possible course variations, as this will "count" as only one fork when calculating the number of possible course variations. In the figure below, the course has 4 forks, which are bound together 2 and 2. The first fork is bound with the third fork (green color), and the second and fourth forks are bound together (orange color). You bind a fork by assigning a "binding group" number to the fork, so all forks with the same binding group number are bound together.